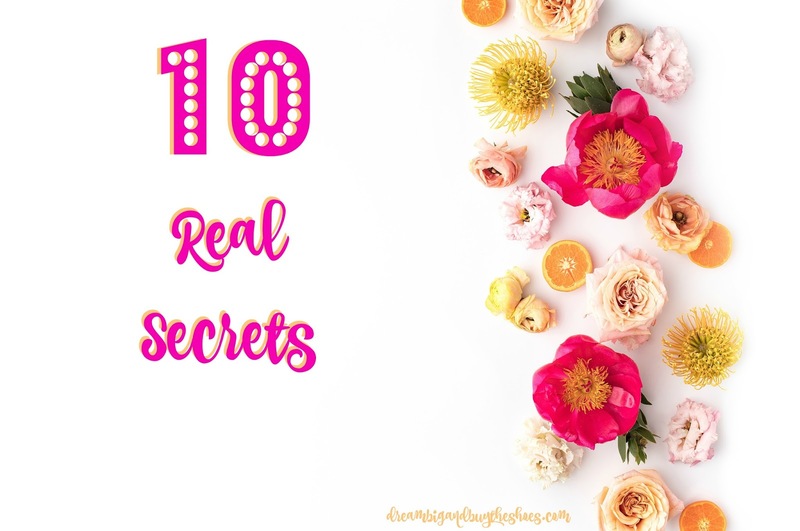 I recently read 10 real secrets on Making Mrs. M's blog and thought it would be a great way to share some more about me here on Dream Big and Buy the Shoes. 1. I don't know how to swim, and I'm okay with not learning. I was always scared as a child and I'm not so much scared of the water now, but just like laying on the beach more. 2. I'm the biggest klutz, and I used to be really embarrassed about it. I always drop things, run in to doorways, stub my toes on every corner and when I was younger I used to get so embarrassed if any of it happened in school or in public around people I didn't know. 3. Gangsta rap is my favorite music and I can still rap Lil Kim lyrics in my sleep. Of course Britney is my #1, but I used to hide in my room listening to Lil' Kim in 8th grade and would sit and listen to Biggie on repeat so I could memorize the lyrics. To this day nothing gets me in a good mood as easily as some gangsta rap. 4. My biggest fear is dying too young. My mom died from breast cancer at 42 and I'm terrified to die young. I feel like there's so much I still want to see and do and never want to miss out on anything with my children. The thought of it makes me sick. 5. I struggle on handling my anxiety in healthy ways. I deal with social anxiety, and years ago was diagnosed with a tad of OCD too. I become very overwhelmed if there's not a plan or if things aren't the right way. It's very silly, but it's real and sometimes I yell or break down in tears if things aren't the way I imagine they should be. I'm still searching for a way to handle things in the moment better and it's very hard for me. 6. My feet sweat, bad. 7. I really want to meet with a medium because I want to know what my Mom is thinking. I know that they can only give you inferences based on their intuitions, but I think it would be very interesting and beneficial and I believe in this stuff. 8. I want to have a 10 year vow renewal so we can have another party. I love my husband and all, but I also love a good party! Our wedding was SO fun and I would love to re-live it all and have another big celebration. 9. I always wanted to be on The Real World on MTV. I'm not sure that I would ever go through with it if I was chosen, but I always thought it would be so cool to live in a house with 6 other people from around the world and experience life in another city to see where that path would take me. 10. I didn't start drinking coffee until 8 years ago.